LM / NTLM Spider is a password audit and recovery tool. Passwords are sources of vulnerabilities in different machines. This tool allows to identify and access password vulnerabilities. Auditing user password is one of the most important problems for network administrator. This is to know the strength of password the users are using. Week passwords represent vulnerability points for any organization. Before using the tool you should select the Interface you want to use. After the interface selection auditing is started. Nsauditor can capture the encrypted hashes from the challenge/response. That challenge is received when one machine is trying to connect and authenticate to another one over the network . 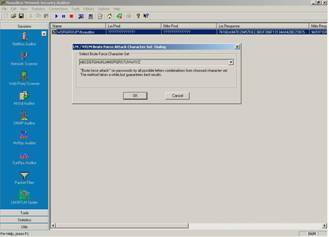 All NTLMv1 authentication packets of SMB sessions ( using commonly in Windows 95/98 and Windows NT 4.0 computers ) will be captured and displayed in the SMB Packet Capture Output window. The field Name contains the user name, the field LM Pwd contains the decrypted LM password., the field NTLM Pwd contains the decrypted NTLM password, LM Response is connected user’s password encrypted with Challenge( the encryption algorithm used in that case is DES ), NTLM Response is connected user’s password encrypted with Challenge( NTLMv1 authentication uses MD4 cryptographic algorithm to encrypt NTLM hashes ), the field Started contains the start and the field Finished contains the end time of capturing process. Select the character set you want to use for decrypting and click on the button OK. All combinations of the selected character set will be tryed. So this process can take a long time, depending on the character set length.